Next on The Scoop: Do Your Cats Like Children? If your cat is sick, there’s a path between aggressive treatment and euthanasia that allows a good quality of life for the time you have left. My sweet Siouxsie is going on 19. She was incredibly healthy until last year. She developed hyperthyroidism, which we tried unsuccessfully to treat with I-131 therapy. Her arthritis has gotten a lot more painful, and to add insult to injury it looks like she’s nursing a case of chronic pancreatitis. It’s been difficult watching my beloved old lady decline like this. She adopted me when she was a six-week-old kitten, and it’s hard for me to imagine life without her. Fortunately, I’ve thought about what to do when this time came, and I’ve chosen to undertake palliative care. Palliative care, by definition, is care delivered as a cat approaches the end of her life. It involves declining or withdrawing the pursuit of curative therapy in favor of maximizing quality of life. Most people think of palliative care for people or pets who are dealing with terminal cancer. The truth is, any chronic and progressive disease can warrant palliative care. 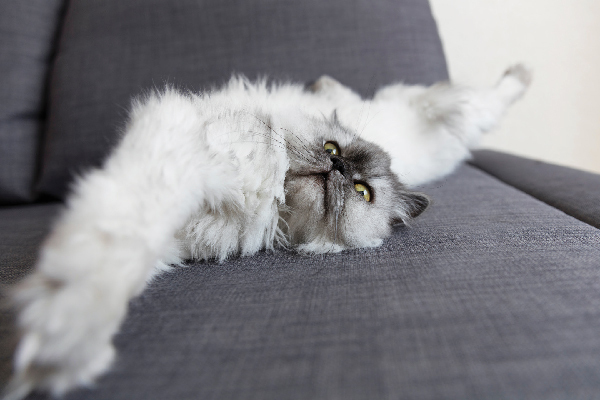 Maybe you feel guilty because you can’t afford lots of expensive advanced treatments for your cat, or maybe you feel like you should be doing more. 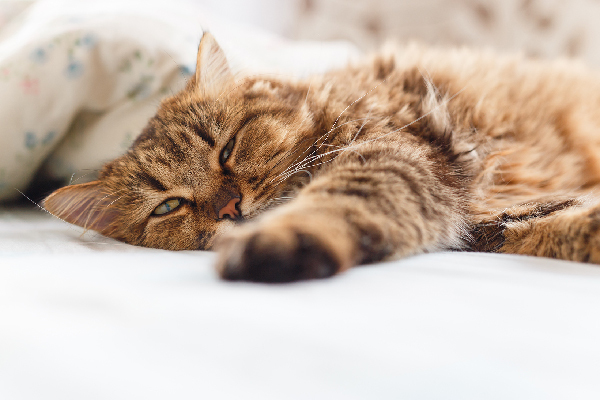 The truth is, all those expensive treatments might not extend your cat’s life, and we’re fortunate to be able to give our cats the gift of relief from suffering. 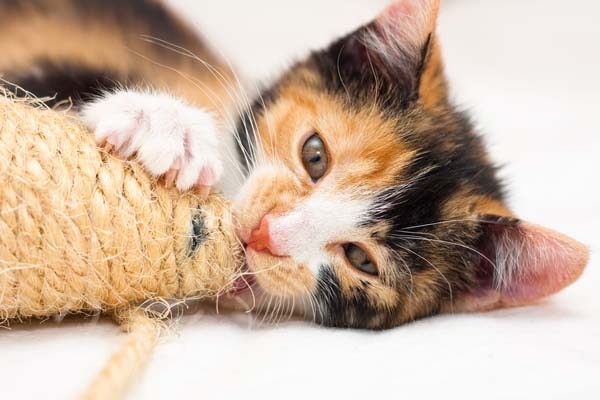 Pain has a huge impact on a cat’s quality of life, but because cats are instinctively driven to hide their pain, it may be hard to realize just how much a cat is suffering until the pain is relieved. In Siouxsie’s case, my vet and I started her on buprenorphine, which has really improved her well-being. Reduction of nausea and other uncomfortable symptoms is also important in palliative care. 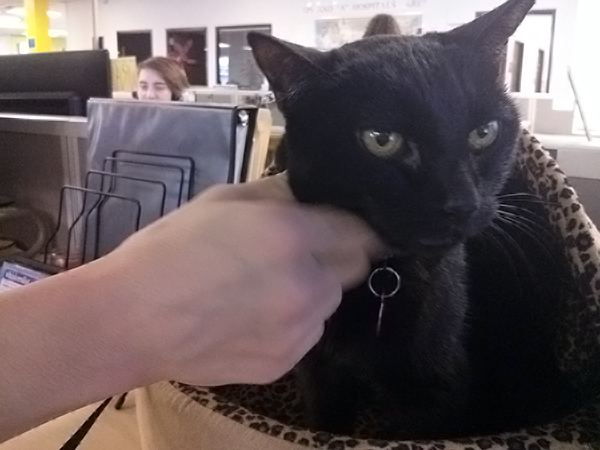 Everyone at my office loves Siouxsie, and when they learned she was feeling lousy and we might be getting near the end, lots of people came to pay their respects. 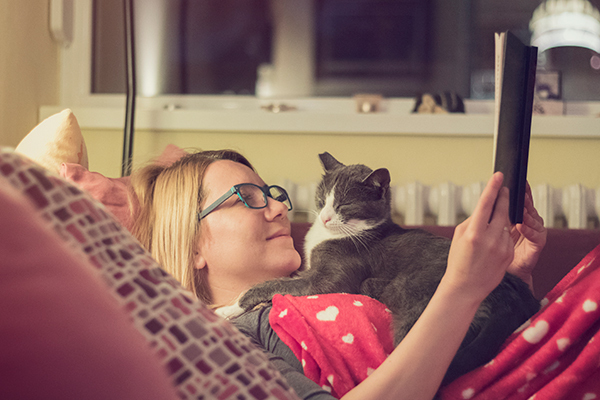 The approaching death of a beloved cat is a very emotional time, and it can be hard to make an objective assessment of how your cat is feeling. The Feline Quality of Life Scale developed by Alice Villalobos can be a huge help if you’re confused or overwhelmed. I’ve named this stage of Siouxsie’s and my journey “the long goodbye.” It’s really hard sometimes: I can’t help but wonder what it will be like without her around, but I know it’s crucial that I stay emotionally and spiritually present. Every day is a blessing. By choosing palliative care, I’ve chosen to face the reality that Siouxsie will die sooner rather than later. My conscience is clear about this choice: I love her too much to let her suffer unnecessarily, and I’m not going to let my ego get in the way of her dying with dignity and grace. 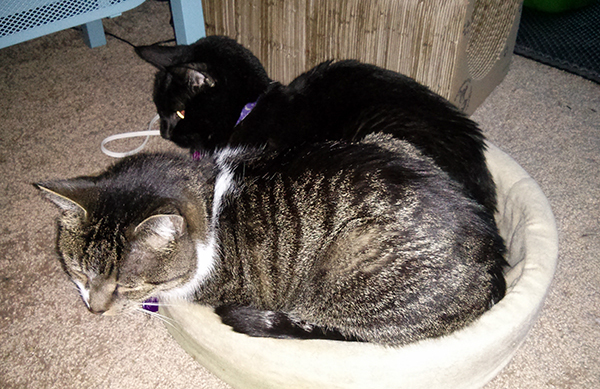 Thomas and Siouxsie share the heated cat bed. These days she appreciates his attention more than ever. 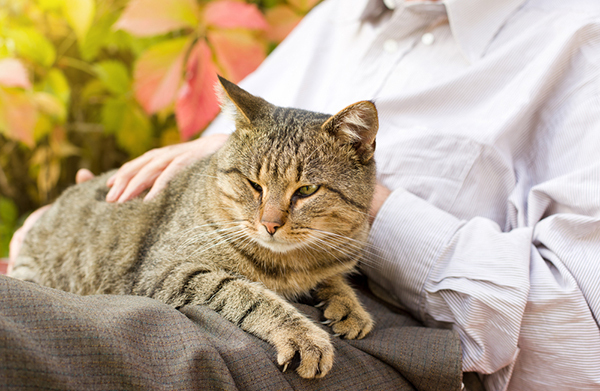 Have you chosen palliative or hospice care for your cat? Do you feel it was the right choice? Would you have done anything differently if you could go back and do it all over again? Please tell us about it in the comments. Would You Have Expensive Vet Treatments Done on an Old Cat? s Cat Heart Enlargement From Hyperthyroidism Reversible? Have You Ever Given Your Cat Medical Cannabis?